A celebration of the love between a father and daughter, and of a vibrant immigrant neighborhood, by an award-winning author and illustrator duo. When Daisy Ramona zooms around her neighborhood with her papi on his motorcycle, she sees the people and places she's always known. She also sees a community that is rapidly changing around her. But as the sun sets purple-blue-gold behind Daisy Ramona and her papi, she knows that the love she feels will always be there. 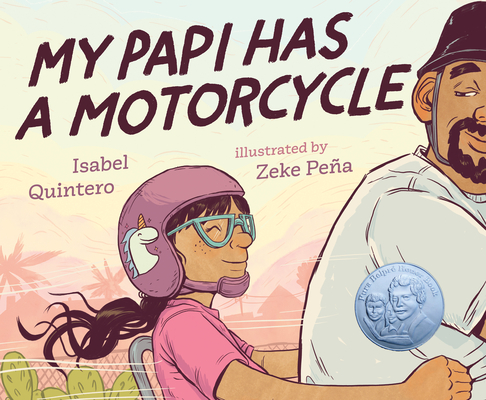 With vivid illustrations and text bursting with heart, My Papi Has a Motorcycle is a young girl's love letter to her hardworking dad and to memories of home that we hold close in the midst of change. Isabel Quintero was born and raised by Mexican immigrant parents in Southern California's Inland Empire. She earned her BA in English and her MA in English Composition at California State University, San Bernardino. Her debut YA novel, Gabi, A Girl in Pieces, won the 2015 Morris Award for Debut YA Fiction and the Tomás Rivera Mexican American Children's Book Award. Zeke Peña is a cartoonist and illustrator working on the United States/Mexico frontera. He studied Art History and Visual Studies at the University of Texas, and uses media and traditional techniques to tell stories that are influenced by cartoons, border culture, and indigenous iconography. Learn more at zpvisual.com.